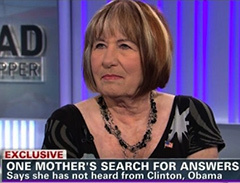 Meanwhile, the NYT, Hillary and Obama have displayed a "Pat who" attitude towards Pat Smith, the mother of Sean Smith who was killed in the Benghazi attack on Hillary's watch as Secretary of State. Yes, liberals like the NYT, Hillary and Obama only give a rat's derriere about liberal women that they can exploit to further their liberal agenda. Cindy Sheehan was a liberal darling until she could no longer further their cause. http://bit.ly/KimIjB Then, Sheehan was thrown away on their pile of broken lives and dreams sacrificed for their agenda.